Free Shipping Included! Queens of Christmas BAT-BWR-16-GO-PW Gold Ball Christmas Wreath with Battery Powered Pure White LED, 16'' by Queens of Christmas at Two Clock. MPN: BAT-BWR-16-GO-PW. Hurry! Limited time offer. Offer valid only while supplies last. 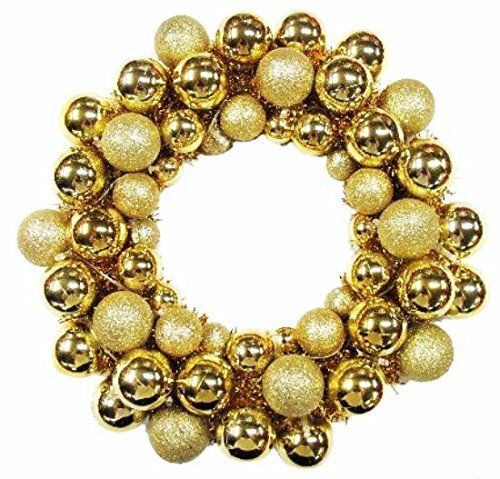 This expertly crafted 16'' battery powered ball wreath consists of 56 Gold plastic shatterproof ball ornaments intertwined with Gold tinsel garland. This expertly crafted 16" battery powered ball wreath consists of 56 Gold plastic shatterproof ball ornaments intertwined with Gold tinsel garland. Each ornament varies in size and shades of Gold. The wreath has 20 Pure White battery powered LED lights throughout and requires 3 "AA" batteries (not included). Contains an ON/ OFF switch for power control. This wreath will be sure to add pizzazz to any room, doorway, or window for anytime of the year.